Focus on long-term success, not short-term comfort. Say no to things that you really want to do, because you know that they won’t take you closer to where you really want to go. Ignore the temptation to follow the herd. And don’t be afraid of any pain or discomfort involved. Suffer today, and benefit for the rest of your life. 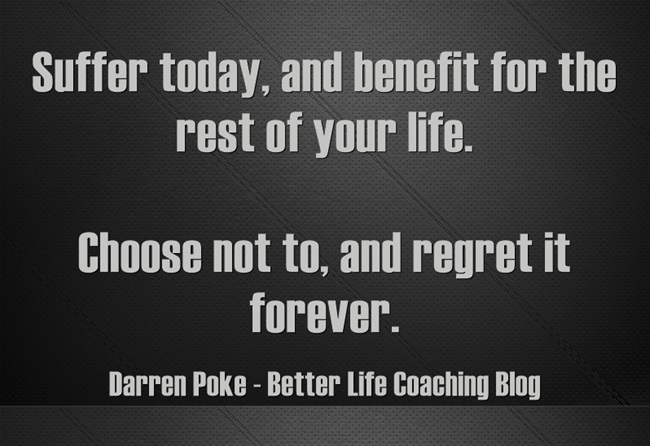 Choose not to, and regret it forever. And if you’re wondering about which aspect of your life this applies to, assume it applies to all of them. Your family, your marriage, your finances, your career/business, your health, every single aspect of your life benefits when you suffer today so that you can reap the reward tomorrow.